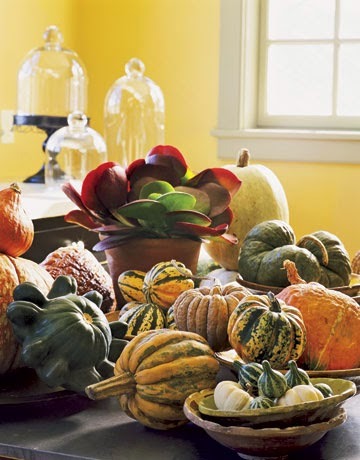 My simple wreath, fabric pumpkins and a fall colors leaf garland seems a bit tame after that! But on to Tuesday Cuppa Tea and my choice today. As you have probably noticed if you follow my blog and meme, I tend to choose by what I'm sharing and this is no different. 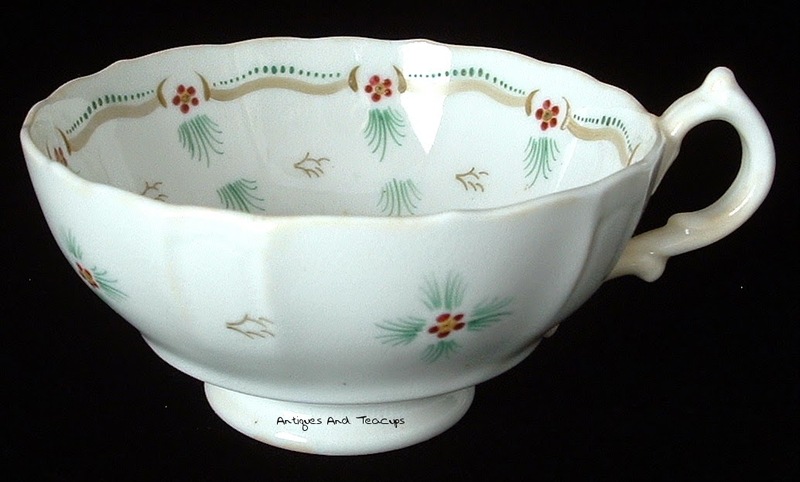 My post today references a lot of Jane Austen things, so I tried to find a cup and saucer that I had that Jane Austen might have used. 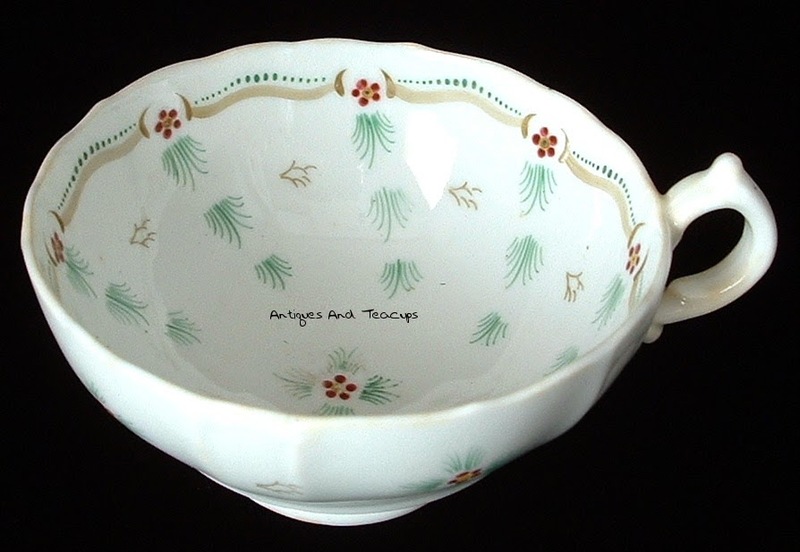 I did find this teacup trio that dates to either the Regency period which was 1811-1820, or shortly after but definitely before 1839, when English china was required to have a British Registry mark...sort of a kite shape with coded number and letter information in the corners...relating to month, day, date and class of china. 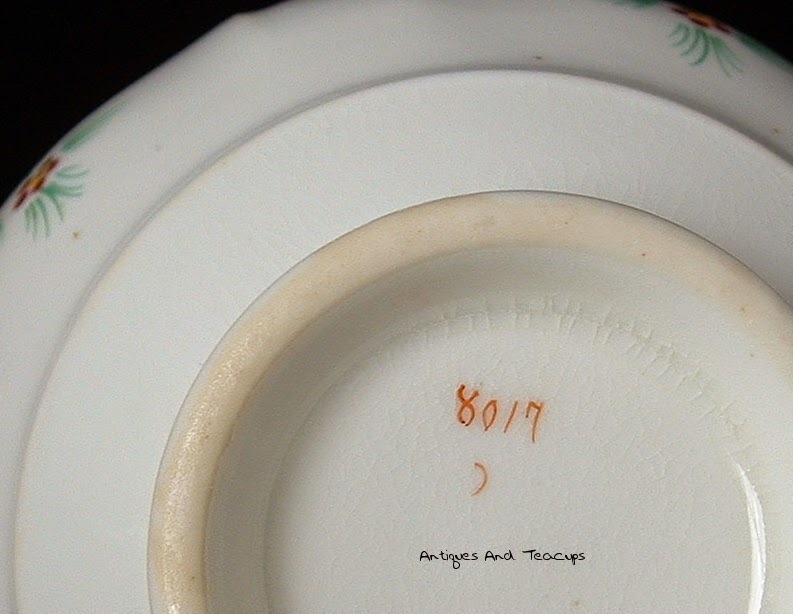 This teacup trio has only a pattern number, which was quite usual for items of this date. 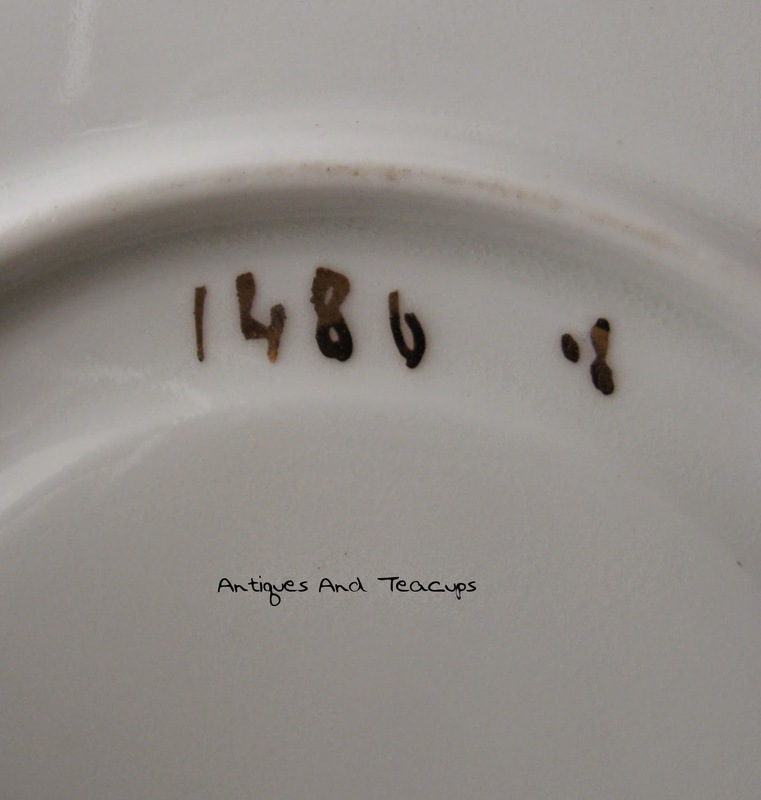 The requirement to mark English china with the maker's name didn't come in until 1891, and before that, most potters didn't. These pieces are generally referred to as Antique Staffordshire unless you can figure out the maker by knowing shapes or patterns. This is very well made china. The set does have kiln dust...black specks...from the firing process, which is pretty normal for the older designs. This design was transfer printed then hand colored. 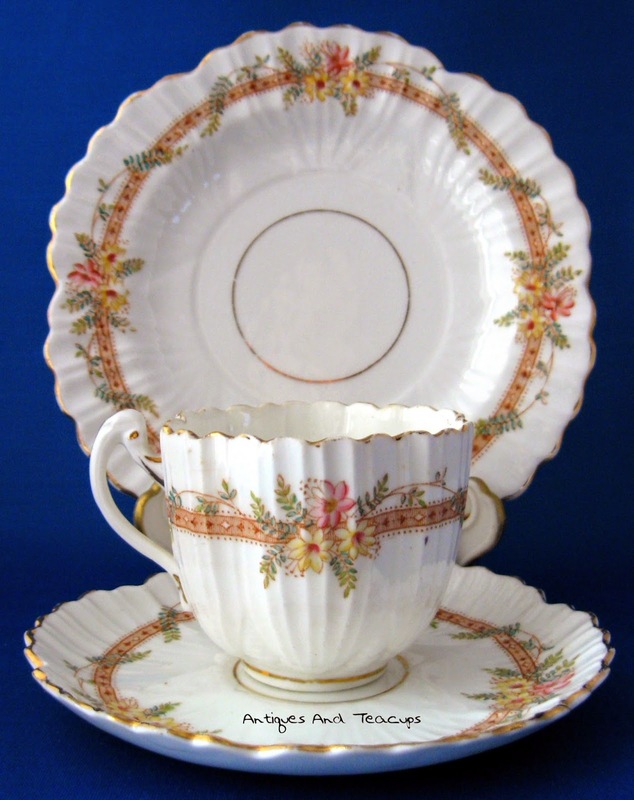 This teacup trio is available at Antiques And Teacups, just click on the photos for more info. I also remembered this single cup I had that is actually from the Chawton area in England where Jane Austen lived, and dates to just before or during her lifetime. 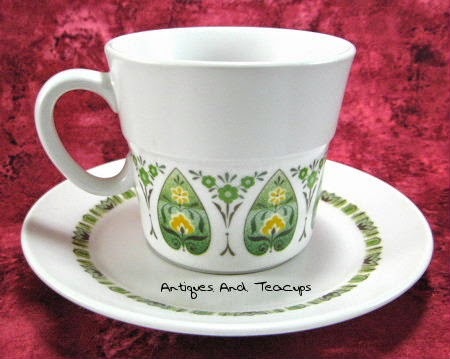 The material of this teacup trio is soft paste porcelain, different from later bone china and ironstone. 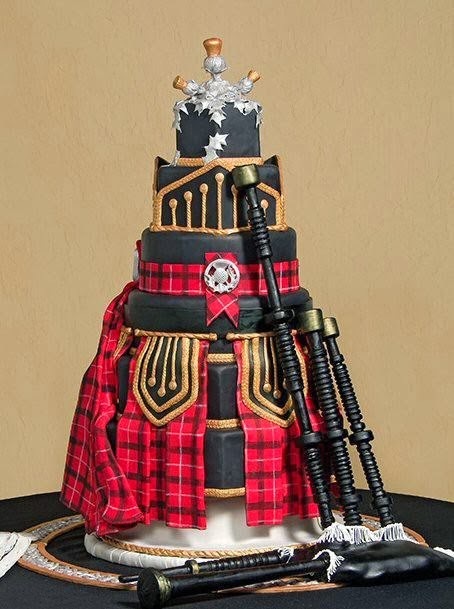 It was considered the bone china of it's day because it could be pretty delicately molded and shaped and was a stunning advancement in china development. You can see that this was made by a smaller pottery. The design is all hand painted and very simple. Can you see the difference in the foot ring above? Look at the one of the teacup above...this foot ring is slightly pinker which is because it is of a different material. This cup...I only found the cup, not the saucer, dates to 1800-1820. I love it! 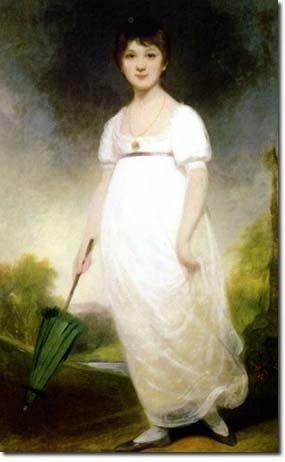 According to the Jane Austen Center in Bath, England, this is thought to be an undocumented portrait of Jane Austen. To read why the owners think so, click the portrait to read the story from the Rice family. Lovely to think so! Also of note in the Jane Austen history, one of only 3 items known to have been owned by Jane Austen was sold at auction in 2013 to American singer Kelly Clarkson for 152,450 pounds. 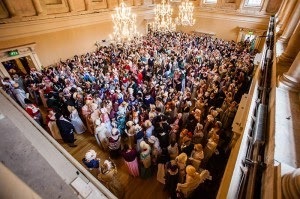 But there was such an uproar, that the sale was frozen and the Jane Austen devotees given until last Dec. to raise the funds to keep it in the UK. 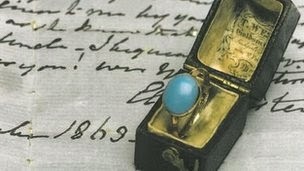 Apparently the money was raised and the ring will remain in the UK at the Jane Austen House Museum in Chawton, England. For the story of the purchase, click HERE. Lastly, I have a related book review. There have been hundreds of Jane Austen novel spin offs, of varying success, over the years. But I got this one on Kindle recently Expectations by Frances Murray which was really enjoyable. It was a pleasure to encounter familiar Pride And Prejudice characters in this novel dating to after Elizabeth and Darcy's marriage. The dialogue was deft, the characters extremely well done and I loved it. 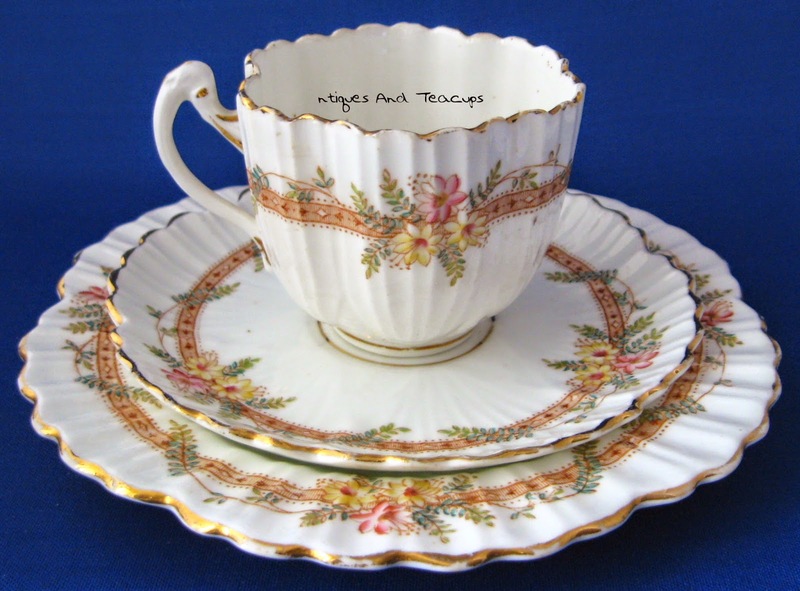 Mr. Collins is just as ...well...you know....and as for Lady Catherine, well"I knew how it would be..."
So that's it for this week's Tuesday Cuppa Tea! 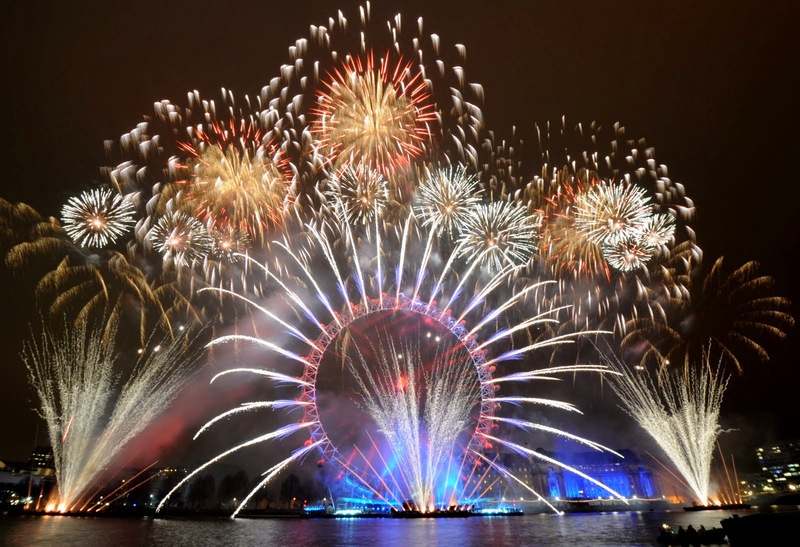 I have the list of some of the blogs I am joining, and the linky for your tea related post. Remember, it is SSSLLLOOOOOOWWW but does work. Please be patient! I love to hear from you! 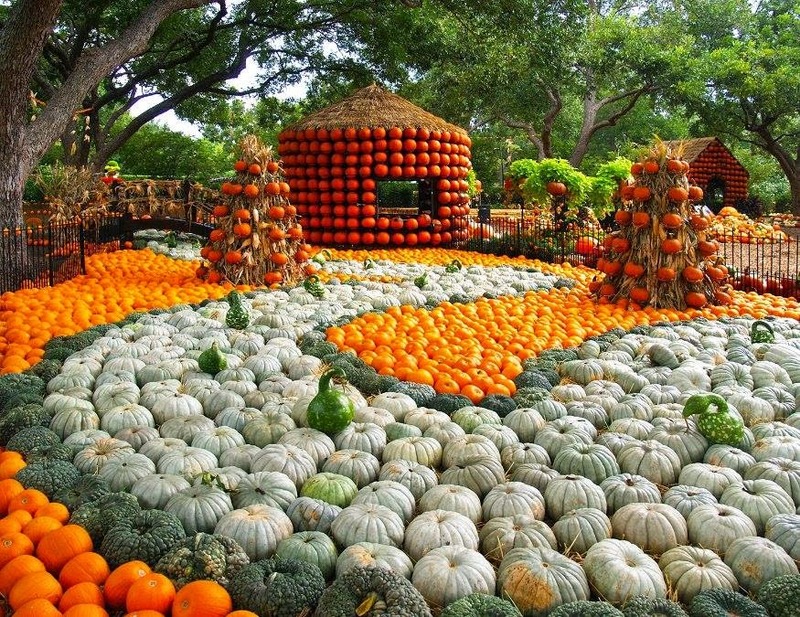 Have a wonderful tail end of September. 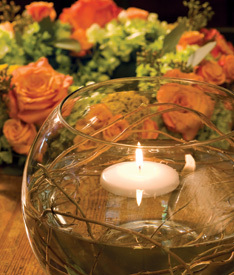 Today I spent my afternoon tea time...more about that later...looking at the new October Victoria magazine. Beautiful. The teacup and saucer are by an English maker called Elizabethan which is a trade name of Taylor and Kent, England. The mark dates it to the 1960-1978. Taylor and Kent were taken over by the Churchill group in 1991, but was later closed and demolished in 1996. Very sad! Another good pottery gone. I am pretty passionate about teacups...I consider them as works of art. And as many of the manufacturers are now gone, I am afraid they will disappear unless we love them! An organic Paisley Brand English Breakfast from Two Leaves...or Two Leaves And A Bud as they are also known. I got in Victoria, BC recently and it is a good strong black tea with a lovely complex flavor. I can taste some Darjeeling in there, and love it! 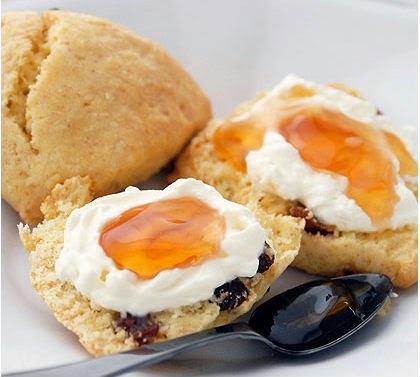 And of course...scones and clotted cream! 1 pint double cream...full fat whipping cream...at least 40% butterfat which is very hard to find. Have a rectangular glass baking dish handy. Pour in the cream, making sure you have at least 1-2 inch clearance to top. Also, the more surface area the better. Put it in a 180 degree oven overnight...at LEAST 8 hours up to 10-12 hours, just check it doesn't dry out. A yellow crust will form on the top...that's the clotted cream. 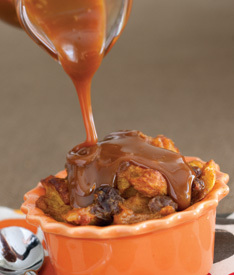 Remove from oven and cool to room temperature, then refrigerate for an hour or 2 until firm. With a spoon, take the cream with yellow crust layer out and put in covered jars in the fridge. If any liquid remains below the cream layer, it can be used like buttermilk, but the thick stuff with the yellow crust is the clotted cream. So thanks for joining me today. 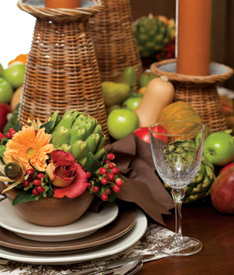 Remember to join Sandi for her Autumn Tea. I'll be visiting these blogs and others which is such a treat! The linky is below for your tea related blog posts...as usual, remember it is SSSLLLOOOOOOOWW but it does appear and work. I love to hear from you! Have a wonderful week. It's official! 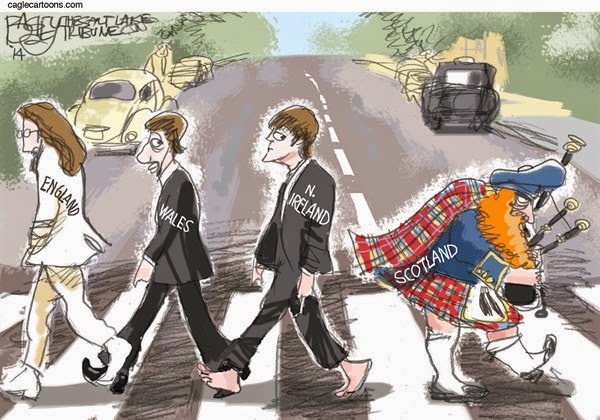 The historic vote is in, and Scotland is to remain part of the United Kingdom! Hi there and welcome to a fall edition of Tuesday Cuppa Tea! 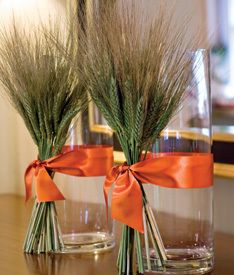 I am very partial to this style..you'll see why later in the post. 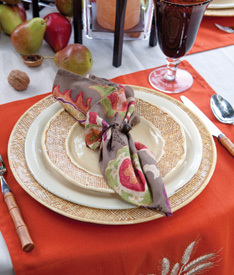 I love the design of this...the pattern looks like a stylized Aspen leaf. The teacup is in porcelain, not bone china like my usual choices, and was in a production line by Noritake called Progression, which was touted as unbreakable, and any breakages would be replaced at no charge. But...that was withdrawn by 1977, so it was obviously a hopeful claim, rather than factual. 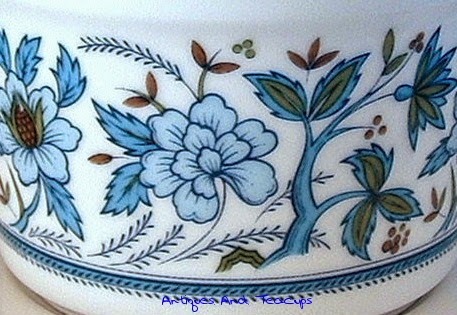 The Palos Verde teacups, teapot, salt and pepper and cream and sugar are available on my website, Antiques And Teacups. The Noritake company was started at Morimura in 1876, and continues to this day, with several hundred different back stamps. 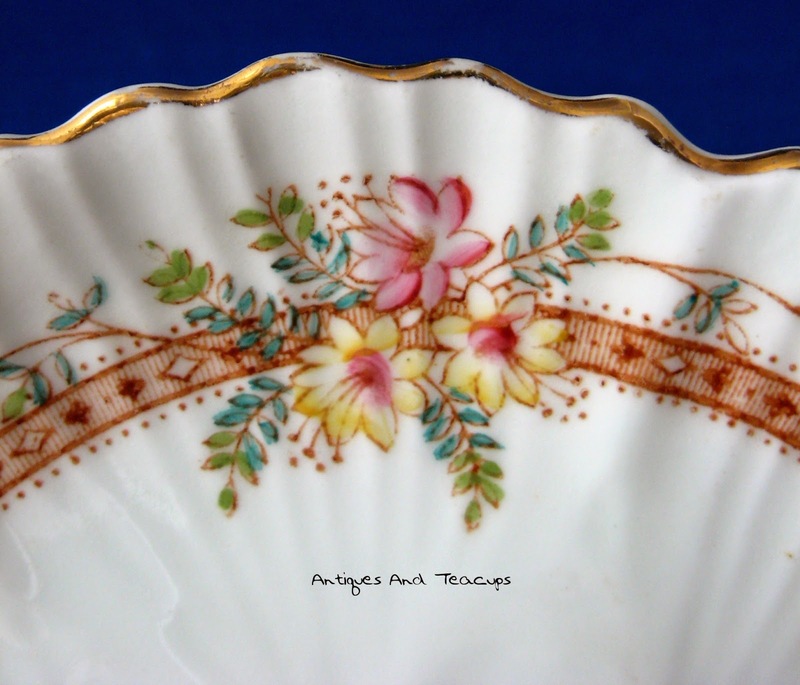 The first Noritake appeared in 1908 but was usually combined with Nippon or Morimura and finally combined with an M for Morimura until it became straight Noritake in 1934. Usually pattern numbers appear, but in this case, the 9020 stands for the line of Progression which had 6 different patterns on the same shape. And you can see by my tea above, why I am so fond of the Palos Verde. I received a set of Blue Moon Progression china for our wedding in 1974 and still love it and use it daily. Beth, of Beyond The Garden Gate blog has the same pattern! Today tea includes the most delicious organic biscotti bites from Dilettante' bakery and a sample of Numi English Breakfast tea I was given by a friend. The tea was okay, but I am afraid I like the depth of the English English Breakfast teas...this was a little weak kneed for me....but the biscotti is wonderful!!! Remember just over a year ago when Prince George was born? 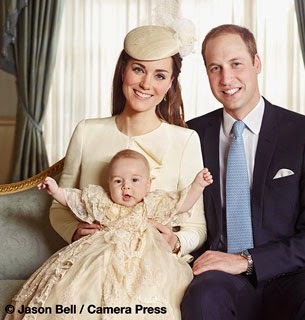 Well, this is old news to some of you, having been announced on Sept. 8th, but William and Kate are again expecting. 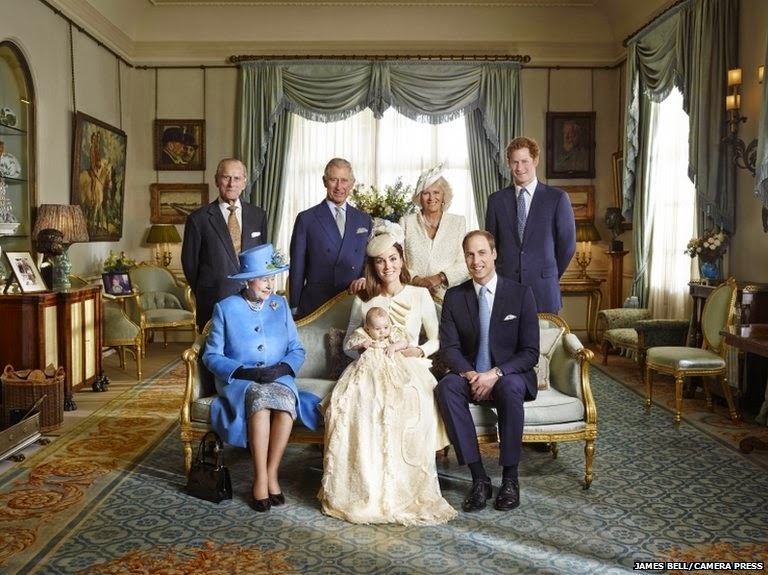 The photo above is my favorite christening photo, as I love the look on Queen Elizabeth's face smiling at her new great grandchild. Kate is again suffering with severe morning sickness, as with her first pregnancy, but is being treated at Kensington Palace at home...their doctors do house calls! instead of at the local hospital because it was such a media circus last time it disrupted the hospital too much. So...Will and Kate will soon have an "heir and a spare" which is the jocular term usually used for the second pregnancy. Kate is about 10-12 weeks along. We wish them the best! 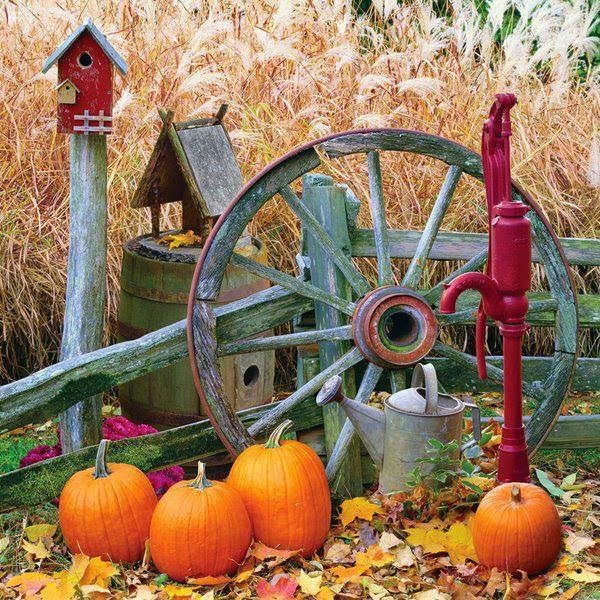 So many friends have been posting such wonderful fall images I remembered these from the Cottage Journal which is sent to subscribers of Hoffman Publication magazines which include Victoria magazine, Tea Time magazine, Southern Lady magazine; Celebrate magazine among others. I get several and they are my favorites. 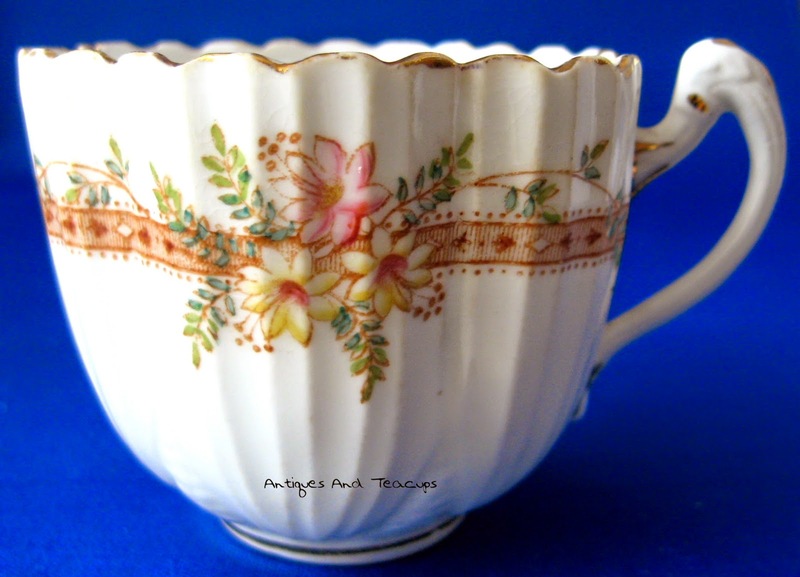 The Tuesday Cuppa Tea linky is below for your tea related posts, and I love to hear from you. I just want to remind you the linky is SSLLLOOOOOOOWWW but it does come up with patience! Have a wonderful week!